Designed for On and Off Road use, each weatherproof low profile light bar produces tremendous light output, with a 12" bar producing 7200 lumens, 3700 more lumens than a 35 watt HID while drawing only 8 amps and boasting an astonishing 292,000 hour life span. Each light bar is manufactured of stainless steel and aluminum for big strength and durability, but measuring in at less than 5" high and 4" deep, Xmitter Light Bars are perfect for mounting in tight spaces where traditional lights would never fit. Vision Xmitter Light Bars are available from 6" to 22" lengths and come standard with flat surface and tube mounts and rubber shock isolators. Each mount slides along the lower extrusion to match any existing mounting holes and it allows for horizontal and vertical adjustment, this patent pending technology is nonexistent with any other light and comes with a lifetime warranty! This new Extreme Intensity LED Technology will blow all other light sources away, and they can take quite a beating; traditional Halogen lights will soon be a thing of the past. 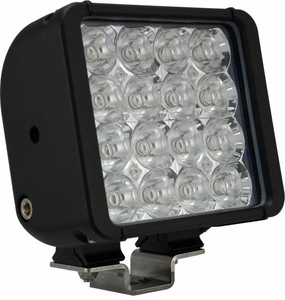 The LED Xmitter bar is ideal for Dirt Bikers, snowmobilers, ATV and other people looking for a light source for their low power ride. The bar will automatically adjust itself to lower amperage so it can even run off a stator on a dirt bike. Available in Euro Beam (Long Distance) and Flood (Wide) Beams.